Cross posted from the blog of GTUG Philippines. 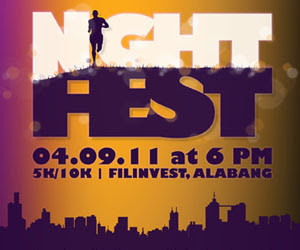 Last April 9, 2011, I participated in Takbo.ph NightFest 2011. It was a night run at Filinvest, Alabang sponsored by Takbo.ph, Skechers Resistance Runner and Magnolia Purewater. There were 2 categories, 5k and 10k (two loops of 5k) and was said to be limited to 2, 000 runners. I challenged myself and registered in the 10k run. After registering for the run, I tried my best to run every Tuesday and Thursday to prepare for my first 10k run. On the run date, I almost had a hard time going to the assembly area because I am not that familiar with the venue. The route was also new to me so I just followed the runners who are ahead of me and the marshals who are friendly and cheerful. There were some uphill/downhill and I am not that prepared for it. There were enough hydration along the route. What I just observed is that there were no trash cans near the Magnolia Pure Water hydration station, unlike in the Pocari Sweat station, so some runners are just throwing the plastic cups anywhere. At the finish line, they were giving finisher's certificate. There were also a lot of freebies from the sponsors. Because I was one of the early registrants, I was also able to get a free Skechers SRR T-Shirt. According to the official results, I finished the run in 62 minutes and 48 seconds. I was 174th out of the 498 participants in the 10k category. Since the 10k was two loops of the 5k route, I checked my time after the first loop. I was able to beat my previous 5k record of 39:50 with 30:54. Over all, it was a nice running event and I enjoyed it. I'll continue running and try to maintain or beat my record. Now, I'm thinking of challenging myself to a 16k run this July.